The upcoming midterm elections might be underwhelming for many Americans, but it could shape up to be one of the most profitable for local TV stations – one of the sources Americans turn to most for news about politics. 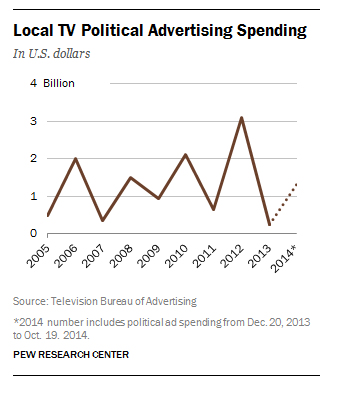 Local TV has been receiving the largest portion of political media spending for at least a decade, but the share it consumes and the total dollars reaped continue to grow. Through mid-October, local TV stations have captured 95% of the television political ad spending, which includes spot, national cable, national network broadcast (local cable political ad spending is not part of this analysis). In 2012, during the last presidential elections, local TV stations captured 92% of total political TV ad spending, based on the same analysis. From January to mid-October 2014, total political ad spending for local TV was about $1.3 billion, according to a Television Bureau of Advertising (TVB) analysis of Kantar CMAG data. Those dollars, though, are far from evenly distributed across the states. More than half of that has gone to 10 states with the most competitive races (Florida, California, Texas, Colorado, Illinois, Michigan, Georgia, Pennsylvania, North Carolina and New York). In Florida, a state with a closely-watched governor’s race pitting incumbent Rick Scott against former Republican-now Democrat Charlie Crist, the political ad spending has topped $100 million dollars, the highest among all states. In the 2012 presidential campaign – the first one conducted after the Supreme Court’s landmark 2010 Citizens United ruling – a record $3.1 billion in political ad revenue was spent in local television. That $3.1 billion was 48% higher than the old record set in 2010, and more than double the amount spent in 2008, the previous presidential election year. A reason local TV is a magnet for political ad dollars is that it is among the sources turned to most for news about politics and government, according to a recent Pew Research survey. Nearly half (49%) of web-using adults say they got news about government and politics from local TV in the past week. 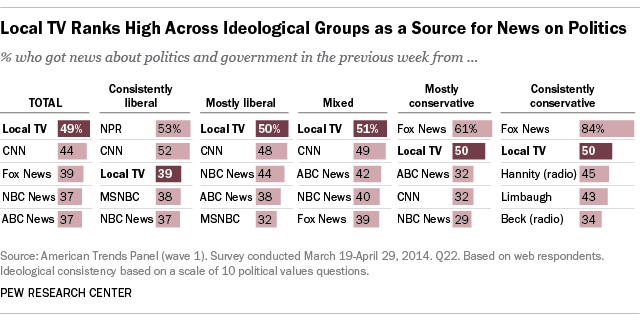 Local TV is also one of the few news sources turned to by Americans from both the left and right ends of the political spectrum. About four-in-ten or more of respondents from each of five ideological groups spanning the political spectrum said they turned to local TV for politics and government news in the previous week. Correction: An earlier version of this blog post incorrectly said that local TV stations captured 95% of total television ad spending in 2014 and over 80% in 2012. It has been corrected to indicate that the 95% in 2014 is of all television spending other than local cable. The comparable figure for 2012 is 92%.